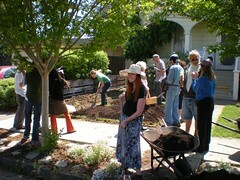 Home › Blogs › Trathen Heckman's blog › 350 Home and Garden Challenge – Stand up and be counted! On a single weekend, May 14th & 15th, thousands of us will take to the streets, the garden, schoolyard, home, apartment and city hall to take action as part of the 350 Home & Garden Challenge. Transition US, in collaboration with a multitude of organizations across the country will transform, retrofit and revitalize our landscapes and homes to grow food, conserve water, save energy and build community. And we need YOU to join us. Stand up and be counted, inspire your family, friends and neighbors to do the same. Amidst a dizzying array of crises and mounting despair, together with our heads, hearts and hands aligned in action we will bring the hope of this historic transition as we descend from peak everything to community resilience. There is a freedom in belonging to something bigger than ourselves, when we feel apart of, not a part from things. And it comes bundled with hope. Not a blind, ungrounded faith that things will just work out. It’s hope as a purposefully engaged state of being, in spite of, even inspired by the state of things and a need to live and love with conviction. These times ask for more from us. They ask for us to rise and shine like spring’s verdant emergence, an unstoppable force of nature. This is what the rapid growth of the Transition town movement and related alliances and movements around the world has been. It’s the power of you and countless small actions taken by passionately committed people and groups of all shapes and sizes living to better your people and place. Alone we can feel that our small acts, even our important victories are not enough, but together emboldened by the power of our shared vision and voice we unleash the genius of community. With the right effort, in the right place at the right time, anything is possible and possibly probable when we live as if it is so. Of course this isn’t just about any one weekend or moment, it’s about building skills, building relations and taking action to celebrate the everyday leaders growing this unstoppable force for a healthy, just and resilient world. This is a movement of movements that 24 hours a day in each watershed, neighborhood and community is living to care for people and place with the fierce grace of a world being born. It’s about stepping up to take action without all the necessary time, money, skills or support. Because the world being born isn’t about resources, it’s about relationships and resilience, the ability to adapt and thrive by staying clear on what’s vital. And what’s vital is nurturing community and regenerating nature by living our potential, one small act at a time. So join us! Rally your neighbors and friends, plan actions big and small and spread the word. Stand up and be counted: register your action today.